View cart “A Guide to Body Sense, vol. 1: Movement Patterns” has been added to your cart. Hadaka-Jime: Practical Unarmed Combat is a unique training program that is based on one core technique. Dr. Feldenkrais developed the program as emergency training for soldiers in World War II. Through ten one-hour lessons, soldiers learned to defend themselves against an armed opponent in the most rapid and effective way possible. The program is based on one Judo technique. Feldenkrais emphasized concepts of the learning process throughout the book.He encouraged the reader to maintain a relaxed attitude, to start with slow and precise movements as he explained the timing, and to master the movements by repetition. The result would be a spontaneous movement which was correct and precise. He claimed that a fighter must first acquire the ability and then put it to practical use. Thus, the first three lessons teach the core technique, Hadaka-Jime. The remaining lessons implement the technique in a variety of situations — against armed or unarmed attacks from different directions — all of which culminate inthe use of the core technique. This approach deepens the learning so that thefighter can effectively perform the core technique with many alternatives tosurvive the situation. Anyone who has tried to acquire a knowledge of this art has certainly soon become aware of the considerable time that has to be devoted to the acquisition of the skill necessary for successful application of the method. Any Judo expert will tell you that something like five years of two lessons a week are necessary in order to become reasonably conversant with all the ways of this subtle art. For Judo does not teach so many tricks, but rather inculcates in the mind and body a special sense of balance and action enabling the body to react to an unforeseen attack, smoothly, swiftly and in the most efficient way. Even if we decided only upon a limited number of tricks, at least a few months would be required, for indeed the whole time is wasted if the men do not feel more confident than before, and they will not feel confident unless a high degree of skill is attained. Without this, the acquired knowledge is of little practical avail, if any. Thus, long and meticulous training cannot be dispensed with, even in such a scheme. 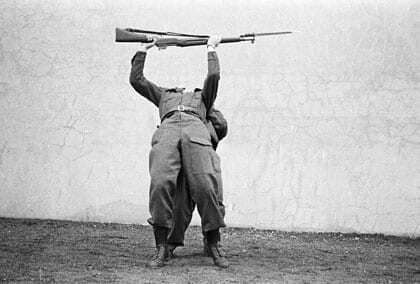 From the point of view of the Home Guard here and elsewhere, we cannot launch ourselves on a long-term training. It has to be made ready for an emergency, which may take place while you are reading these lines. That is why I devised this emergency course. It provides “first-aid” equipment. Good medical treatment will be looked for as soon as possible. If we have the leisure to build up subsequently all-round fighters out of all the men, so much the better. But a “first-aid” is always a good acquisition. Now let us see what our first-aid box contains and whether we can depend on it in case of emergency. A hasty glance through the text and illustrations in the book will show you that the field covered is quite large. At any rate, the most probable cases of emergency are met. It will also show you that it is all centered around one fundamental movement. The advantages of such a condensed system are very substantial, for in a lesson lasting one hour, a single movement can be repeated at least a hundred times; then in the following lessons this movement appears repeatedly in unexpected modes and applications, through which a keen interest is maintained during the entire course. By the time this is completed, one has repeated the fundamental movement more than a thousand times, which is sufficient to attain a high degree of skill in its performance. There being only one movement which is so familiar that little conscious effort is necessary to bring it instantaneously into action. There is, moreover, no room left for making mistakes as to the choice of an appropriate movement. The great advantage, however, lies in the fact that in a fortnight or so, the whole body of a service, the Home Guard or others, could be trained and made ready for an emergency which may be imminent. “Dr. Moshe Feldenkrais was a remarkable man; teacher, soldier, researcher, judoka, visionary, martial artist, physicist, and pioneer. He was a founder of the European Judo Union, and respected by Gunji Koizumi, Mikinosuke Kawaishi, and Jigoro Kano. I therefore consider it an honour and a privilege to have been asked to write an endorsement to the new edition of his important text. I met Moti Nativ when he visited the Bowen History of Judo Archive at the University of Bath to continue his research into the life and work of Moshe Feldenkrais. I was immediately struck by his passion and commitment, and his depth of understanding the relationship of mind and body as applied to Budo. “Hadaka-Jime: Practical Unarmed Combat is just as vital today as it was 67 years ago. The systematic steps and strategies shown from this ‘one core’ movement confirm the principles throughout the book. The practical applications can be used as a foundation of study in any martial art or self-defense course. “This impactful book reveals a pioneer who is equal parts warrior and educator, and offers a snapshot of a method in the midst of its making. If you follow the trajectory of training outlined in this book, you’ll find the very same strategies and techniques that become the basis of Dr. Feldenkrais’ yet-to-be-announced method. By teaching only one martial arts technique, Feldenkrais creates a lesson-like experiment, rich in the interplay of theme and variation. The training reveals the big picture as it clarifies the details and, just as the student begins to put it all together, Moshe changes the action’s orientation to space. And so on! The book features photo sequences demonstrating the technique in a variety of situations. One such sequence, the seventh lesson, Overcome Attack with Bayonet from the Rear, is presented below. Further, Moti Nativ demonstrates the technique in a video.